Flower buds bright dark pink, contrasting with pale yellow-green foliage, opening white; foliage yellow, fine; habit upright. Seedling raised by Helmut Hiedl (Altusried, Germany). 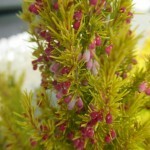 Resistant to Pestalotiopsis (an endophytic fungus that attacks heathers); suitable for cultivation under glass. See http://www.hiedl-gbr.de/aktuell2.htm (accessed 2 January 2015).